Very nice knives. My only lobster, a Keen Kutter. Kathy, I am glad that I sold the knife to you. Evere since I showed it to you years ago at the Lewisburg show I knew it was just a matter of time before I sold it to you. Here are the only 3 I have left. The Kipsi Kut is one that still don't believe I own, it's a rare one for sure!!! The others are H & JW King etched pearl and the last, and am not sure if all would say a lobster, is a sterling handled Napanoch. Wow.... those are 3 rare knives! I am not sure which one I would say I like the best? They are all fantastic. I am unfamiliar with Kipsi Kut? Do you know more about it? I am honored to be the new owner of the Electric. I showed it to an old friend & long time collector yesterday. He said "that knife makes me scared to even hold it!" He told me if I dropped it, I would never smile again & he is probably right. Kipsi Kut was located in Poughkeepsie NY and I only know of about 8 of these that are floating around. Same town as Nagle Re-Blade production. Here is my other favorite lobster knife... an ivory Northfield lobster. It is illustrated in the 1869 catalog as a six blade, but is listed as a three blade. What is the extra pin for on the back handle? Miller Bro`s wrote: What is the extra pin for on the back handle? Thanks for the compliment! For you to say it would be a "favorite" says alot! I can't see a reason for the extra pin other than maybe stability? The knife really looks to be unfooled with. Here is one view from the side with the nail file. I can't get a good scan of the other side because of the curve in the knife. I will ask Bret what he thinks when he gets home. I think it is for the additional spring for the other blade.It probably only goes halfway through the knife because if it went all the way through.the master blade couldn't close. JMO. Kathy , Danno & Mike sweet knives ! top one is a Universal, LF&C.conn, bottom is a Walden Knife CO.
Now... that's what I am talkin' about!! 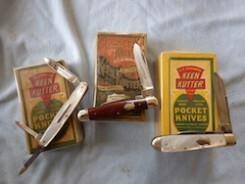 Very cool knives, Paul! I especially like the Walden. Drop dead gorgeous! knifegirl888 wrote: Now... that's what I am talkin' about!! Very cool knives, Paul! I especially like the Walden. Drop dead gorgeous!